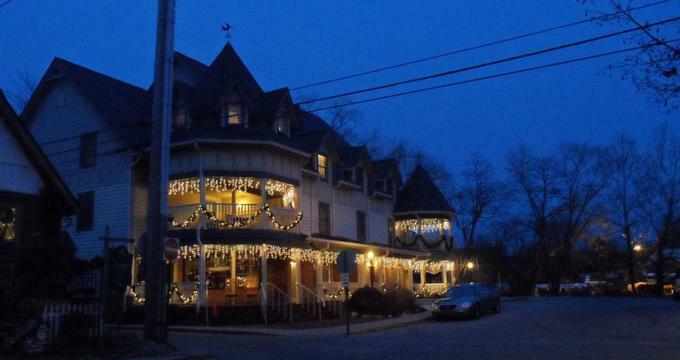 Established in 1993 as a small bed & breakfast, the Cornerstone Inn has grown into a charming 35-room guesthouse and inn that offers a warm and welcoming retreat. 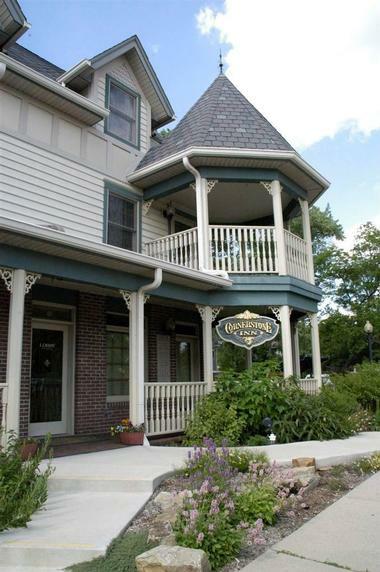 Located in the heart of the beautiful Brown County in Indiana, the inviting, home-away-from abode features exceptional accommodations, welcoming hospitality and a perfect location for exploring the region. Tucked among the undulating hills of Brown County, the Cornerstone Inn is a beautifully restored historic home with 35 individually appointed guestrooms, a trendy studio apartment, and a cozy log cabin for families and groups of friends traveling together. Guests staying at the Inn will enjoy delicious buffet breakfasts, afternoon treats and sweet evening desserts. Set in the heart of downtown Nashville, the Inn is just a few steps from a wealth of Nashville's attractions and entertainment, including excellent shopping, fine dining experiences, art galleries, museums and more. It is also just a few miles from the renowned Brown County State Park and just 50 miles from Indianapolis. The Cornerstone Inn features 35 individually appointed guestrooms, a trendy studio apartment, and a cozy log cabin for families and groups of friends traveling together. Premier, Tower, and King Suites are luxurious retreats styled with an Art Deco theme in the main building and feature king-size beds, private bathrooms with deep two-person whirlpool tubs and walk-in showers, double vanities with quartz counter-tops and custom made cabinetry. Spacious living areas have double-sided round gas fireplaces, plush leather reclining lounge chairs, velvet loveseats and tables and chairs, as well as modern amenities such as flat-screen televisions, wet bars, and kitchenettes with coffeemakers, microwaves, and mini-fridges. 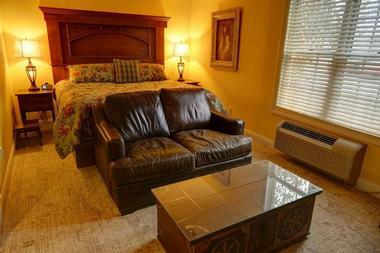 Wireless Internet is available throughout the property. Cottage Suites consists of Shiloh, Cane Ridge and Goshen Suites located in the respectively named buildings and feature king-size beds, private bathrooms with double whirlpool tubs, walk-in showers, and spacious living areas with gas fireplaces, sofas, flat-screen televisions, and DVD players. Small kitchenettes have microwaves, mini-fridges, and microwaves, and private screened-in porches boast beautiful views. Built in 1868, Tudie's Cottage is a cozy stand-alone cottage off Cornerstone Lane and is the second oldest home in Nashville. The charming abode features two queen-size bedrooms and a third bedroom with twin beds, a comfortable living room with reclining chairs, twin loveseat, flat-screen television, and a dining room. A fully equipped kitchen boasts modern conveniences and a screened-in porch is the perfect place for long, lazy afternoons. The Loft is a well-appointed studio apartment with contemporary decor and modern amenities with a comfortable and stylish ambiance. The apartment has a private entrance, spacious living area with comfy seating and a Wi-Fi-capable television, fully-equipped kitchen and dining area, and a separate sleeping area with queen-size bed and private bathroom with shower. Cabin 360 is a beautiful log cabin on the property that is ideal for small families. Built as a schoolhouse, the cabin has been lovingly refurbished to create a comfortable retreat that features one queen suite two bathrooms with showers and a whirlpool tub, a fully equipped kitchen, and inviting living spaces with comfy seating and a gas fireplace. The Cabin has a beautiful porch with outdoor seating and views of the surrounding woodlands and access to a fire pit. Complimentary breakfast is served for all guests in the dining room in the main building, as well as afternoon snacks and evening desserts. Breakfast consists of hot and cold dishes, fresh fruit and yogurt and coffee and tea, afternoon snacks feature freshly baked pastries and treats, and evening desserts include sweet treats to indulge on before bed. The Cornerstone Inn features three functional and fully-equipped spaces for meetings, conferences, and other events. The Meeting Room can seat up to 50 guests in an auditorium style and 30 in a classroom style, and offers amenities such as an HD LCD PC-compatible television with multimedia projector, flip charts, and wireless Internet. 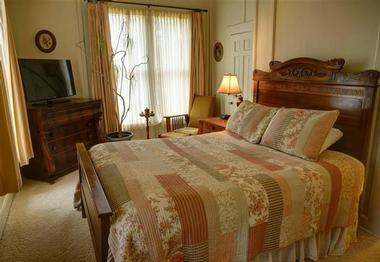 The room also features a gas fireplace, small fridge, and beautiful antique decor. The Chapel is a beautiful naturally lit space that can seat up to 30 guests in an auditorium style and 16 in a classroom style, and offers amenities such as an HD LCD PC-compatible television with multimedia projector, flip charts, and wireless Internet. The Upper Rooms Common Area has a boardroom type table for up to 12 guests, and offers amenities such as an HD LCD PC-compatible television with multimedia projector, flip charts, and wireless Internet. This area also features a fully-equipped kitchen with an ice machine.